(The Guardian): The European court of human rights' could have its powers downgraded by handing ministers across the continent the right to strike down rulings under plans being examined by the British government. 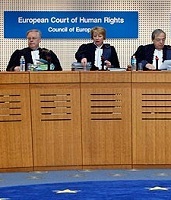 A commission set up by the government to examine reforms to the Strasbourg-based ECHR has floated the idea of handing ministers and parliamentarians on the Council of Europe the right to override rulings of the court. The suggestion by the commission on a Bill of Rights, in a letter to Nick Clegg and Kenneth Clarke, was published as ministers made clear that the court needed to undergo wide-ranging reforms. Clarke told MPs on Wednesday there were "important decisions" to be made about the workings of the court.